Something I love about Jason is his go-getter work ethic. If he wants something, he does what it takes to get it--no matter the obstacles or the amount of work or time involved to get there. Something that seems to surprise many people who don't know him well is that Jason started working from a young age. Before he was 21, he had already started his own trucking business, owning a semi truck and all. And three years later, he bought his first brand-spanking-new semi truck, and a trailer too. All the time we had talked about getting married, and even about half the time we were engaged, the plan was for him to relocate and sell his business in the process. He had started working on the process of selling his semi and trailer to his brother when we realized there was no way it was going to work to stay in California. Jason still sold his truck and trailer, and we used some of the money to put a down payment on what is now our house. Jason had had job offer after job offer for work in the area near where he grew up (and near where we are now living). So now with a place to live and call home, off he went to work for someone else--something that he, as a business owner hadn't done in a long time. It meant weird work hours from day to day. One day he would he up for work at 4am. The next, three hours earlier. And the week after that, he would get to stay home with me until 10 in the morning and then be gone until late in the evening. One night, a break down with the truck he had been driving even caused him to have to be away overnight, the first time we were apart overnight since being married. Some people said he wouldn't last long working for someone else. The bets started piling in. "I give him eight months before he has a new rig", "I say it'll be eight weeks". When he told me that people were guessing how long it would be until he bought a new truck and would have his own business again, I had already made my guess: 2 months. At the end of October, the calls had been made and the order had been completed. 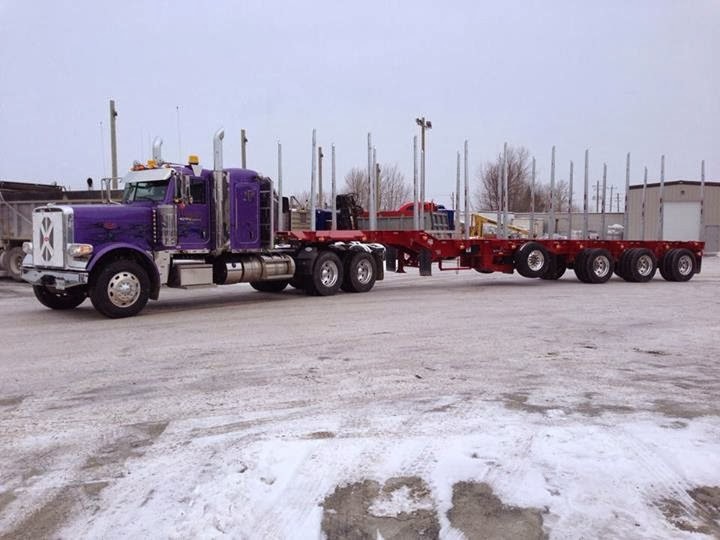 A brand new Peterbilt, the same shade of royal purple as the first new truck he owned was in the making. Five weeks later we were headed on a four hour drive to pick up his new baby. As we were about to head out the door, Jason kept asking me which jacket and shoes he should wear. "Are you dressing to impress your new truck?" He stared at me for a second while pulling on one of his running shoes before bursting out into laughter in a way that definitely said, "Yes." The look on his face was priceless when we drove by the lot and he saw his truck through the large garage window for the first time in real life. It was even more so when he hopped in the driver's seat of his new truck for the first time. I am so excited for him to be back doing something that he loves. And more than that, I am so proud of him for being such a hard worker: in all the years before we got married, and in all the years before we knew the other existed, because his hard work has let us live in this wonderful house and it has now let him be able to get back into being his own boss while doing what he loves. I think some people must have thought I was crazy to so calmly let him buy a new truck and trailer. But the thing is, I trust him. I know how hard he works for what he wants, and he's already bought a new truck once before. When I made the guess that it would only be two months before he ordered a new truck again, it was because in my heart I know him more than I know anyone else. And I know that like me, he is a dreamer, and won't settle for less than the best if he knows he can reach just a little bit higher to go infinitely farther in the long run. I didn't hesitate for a minute when he told me all those weeks ago he was thinking of buying a new truck because I already knew. And I already knew my answer would be yes when he would run the idea past me. Today is his first day of work with the new truck and trailer and all day he has been elated in a new way and it brings my heart so much joy. Whenever we come home now, we see the semi sitting there, facing us at the end of our long driveway. The chrome gently reflecting the headlights in a way that would make you think the truck is smiling back at him. And it's just another reminder to me of what an awesome man I have the honor to be married to. PS: Can we all just appreciate that my name is painted on the passenger door of his truck ? !